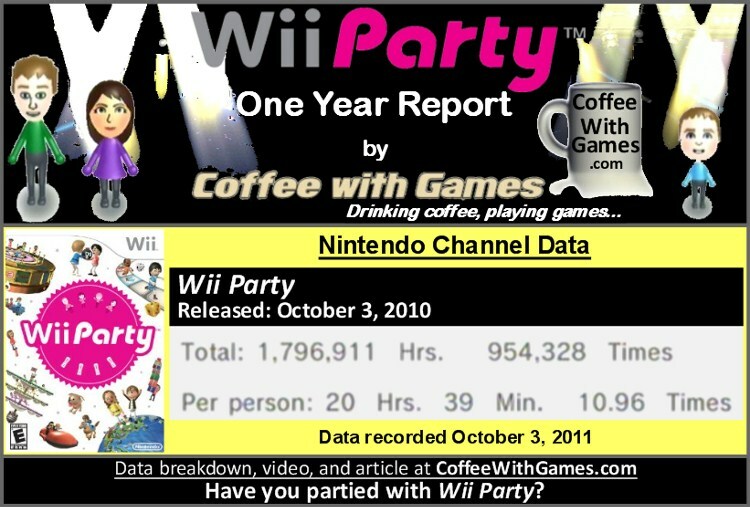 Wii Party now has 87,073 Wii owners reporting game-play hours through the Wii's Nintendo Channel. Wii Party has seen an increase of about more 69,411 more Wii owners reporting data since the last report based on data recorded from December 27, 2010. Wii Party now has 1,796,911 Total Hours of game-play reported, which is an increase of 1,553,120 Total Hours since the last report. The average play-time is now 20 Hours 39 Minutes "Per person"(or console) reporting data, an increase of 6 Hours 51 Minutes. The game's average play-time per day/session reported is 1 Hours 53 Minutes. Wii Party's Amazon.com sale rank is currently #323, and is selling for $33.49 fulfilled by Amazon. On December 30, 2010, it was ranked #74 and selling for $44.99. Wii Party's "professional" review score average is 70.44%, based on 25 reviews on GameRankings.com. The game has a 4 out of 5 Stars rating on Amazon.com, based on 191 customer reviews. Wii Party's customer review score average is 83.35%, when the reviews are converted to a 100% review scale. Have I partied with Wii Party? No, I have not. I honestly felt that Wii Party was a holiday cash-in attempt by Nintendo last year, instead of them delivering a game that used the Wii and its peripherals in interesting ways. The reason I thought it was a cash-in, is because the game does not use the Wii MotionPlus attachment in any way, it does not use the Wii Balance Board in anyway, and of course, no online anything. When some third party developers were able to implement Wii MotionPlus and Wii Balance Board controls in some of their games very quickly, but make them only optional, it just made me think that Nintendo had Wii Party's mini-games sitting around for a few years and threw them together as a holiday release. What about the reported game-play data? I think it shows that Wii owners that have purchased Wii Party are really enjoying the game, and the average hours reported "Per person" are more than I was expecting the game would be at this point, as I thought it would hover around the low to mid teens. Will I ever play Wii Party? Well, I don't plan on purchasing it, so unless I end up at somebody's house that owns it, and we have a Wii Party party, I don't think I will ever play the game. Have any of you played Wii Party, and if you purchased it many months ago is it a game you play by yourself? Or, is it only one of those games that you break out when family and friends are over? Also, if you have played any of the Rayman Raving Rabbids Wii games and Wii Party, are they along the same type of "party" games, or aimed at different audiences? I was thinking about buying Wii Party, but when I saw the Australian price I instantly when for the bargain bin. OK, that's false, but I still didn't buy it. I really don't like the way Nintendo (Australia) marketed it. I hadn't looked at it much with the $49 pricetag and suspect I won't be. I was considering getting this at a discounted price... but then I saw Fortune Street, and I'll just wait for that (which will be a day one purchase for me). To answer one of your questions, the Wii's party game line up are all aimed at roughly the same market I think - families with at least one small child. Often they're good games, but a more adult party game would have been welcomed. I was hoping We Dare could be that game... I think there's a market there for a good adult party game. But emphasis on the good. I can vouch that Wii Party is a good game. I didn't feel it was a cash-in as you put it. It had many modes, fun mini-games, and lots of variety. I was surprised NoA dropped it to $39.99 so quickly, but I think the sales ranks show it's not selling like it was last holiday season, though it may pick up again this holiday season. I really wonder when this will become a Nintendo Selects title, with this probably being the last holiday season before the next Nintendo console...I would think it may happen soon. I remember the We Dare ordeal, and I'm surprised how quickly that went from game, to no game. I just thought it was a cash-in, due to the fact it didn't use Wii MotionPlus or the Wii Balance Board in any way...I know those aren't necessary, but I think it was Rayman Raving Rabbids: TV Party made it an OPTION in some mini-games to use the Balance Board, which is what I would have liked to see with this. Do you think you're well above the "average hours" reported for the game, and did you play it by yourself, or do you play it with others? "I've thought about picking it up, but sort of waiting for a much marked down price." Nintendo Selects seems like what you'd be looking for, or free if you win in it a contest somewhere.